Do you need to teach composition in Elementary School Music? If you follow a national or state based curriculum such as the common core (USA) the answer is likely to be YES! Besides the requirement to teach composition in curriculum, music teachers also teach composition because it is a fantastic way to teach all music concepts. Students discover music with their own creativity, and in today’s world this is an amazing way to teach! Teaching composition should be as simple as teaching painting or drawing for a young class. So why isn’t it? We need to put in place ideas and methods that make the teaching of composition simple so that students are empowered to create new ideas on their own. Completely covers the composition component of the Common Core (USA) and similar curricula around the world. If you’re familiar with the Common core, you’ll know that standards 1, 2 and 3 relate to composition, requiring students to “generate and conceptualise artistic work” and then develop and present that work. We’ve explored the detailed standards for each grade, and explored how best to meet the standards in a way that works for students. If you’re teaching classroom music, you’ve got so much to do already to prepare lessons, organise instruments for your children, organise choirs and bands and prepare them for performances! The ‘flipped classroom’ nature of this program means that you can add these lessons to your teaching with very little preparation. Seven online training sessions, which you can watch live if you wish, or catch up on whenever it is convenient to you. This will be presented in seven weekly training sessions – one focussing on each grade level from Kindergarten through to Grade six. Each week we will present the student videos and explain all the methodology behind them, and talk through how the activity relates to the curriculum. 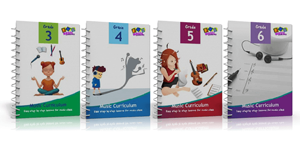 Each week will focus on one grade level, and you’ll get a program of ten lessons for the grade, which are all uniquely created for the age group. Each lesson consists of a short classroom video, which you can choose to show the students or not, and any interactive digital resources or worksheets that are needed to complete the activity. There is also a printed lesson plan which outlines the activity for the day. Tickets only available for a limited time! In Grade 3 we begin by focussing on body percussion for the first four lessons, and students put together their own class ensembles. Students then begin some simple improvisation, using only one note at first, and then learn to notate their ideas using 'stick' notation. In Grade four we are using a lot more improvisation in the lessons, using more accurate notation and expanding their range of notes. Students will also create accompaniment patterns using technology, and then real instruments. In Grade 5 we gradually add in more technology, with around half the lessons using computers or tablets with sequencing software. Students also continue improvising with gradually more and more complicated scales and structure, giving them more tools to create with. In Grade 6 our focus is on technology with most of the lessons using individual computers or tablet devices. We have structured these lessons so that no matter what computers and software you have available.. you can still use these lessons! Grade six students will love creating their own movie soundtrack for a short film, plus creating their own rap beats and spoken chants. In this session we come right back to the beginning,.. for the tiny children who are just starting school. Here we begin with the first lessons children start with.. starting with the musical elements of sound, silence, dynamics and pitch and we get them making musical soundscapes to a story using instruments or appropriate technology. In Grade 1 we begin to use iconic notation to organise the children’s musical ideas, and children draw pictures and create their own simple compositions. They also continue to work on their improvisation skills and create their own question and answer phrases. In Grade 2 we look at expression of emotion and musical ideas through their improvisation, and we also create some soundscapes and students will create the musical accompaniment for a poem. Do I have to attend live? What if I have a commitment at the time of the session? You will have full replay access via our members area, so you can watch the sessions whenever it is convenient to you. However it is great if you can attend the sessions live, as you can participate in the chatroom and learn ideas from other participants and ask questions as well as the session is going on. What technology or software do I need for these lessons? For Grades K-4 you will require NO additional software to use the lessons. Where a technology element is required for the class whiteboard, we provide it via our members area for you, and nothing needs to be installed. In Grade 5 and then a lot more in Grade 6 the students gradually start using individual computers or tablet devices. For these lessons students will need a simple music sequencing application. For apple devices we recommend GarageBand, and for Windows PCs and android tablets there are numerous free alternatives. We have made the lessons non platform-dependent, so you can use them no matter what type of devices are available to you. 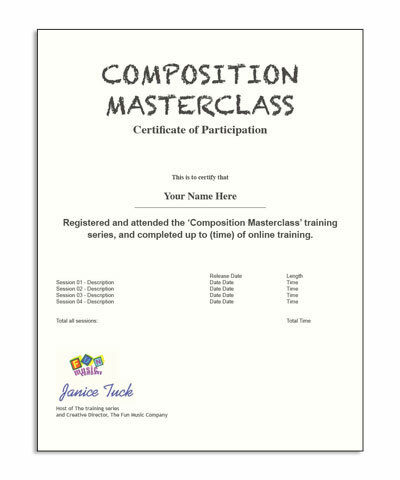 I've never taught composition before! Do I need much background to understand this? You don't need any background in music composition to be comfortable teaching this. Even non music specialists should be able to use these lessons, because the student tutorial video is included. Isn't this form of teaching (with student videos) taking the teacher 'out' of the teaching process? Absolutely not! Our aim is to provide a short 3-5 minute video which can be shown in the classroom to explain the activity, but it is not essential! If you're teaching it, and you wish to skip the video, and explain the activity yourself, then you can feel free to do so! You can also watch the video with the students, and then expand on the activity, making it your own and suited to your students. We hope that our student video is just the beginning, and teachers will only use them some of the time. The videos give the teacher the option of very little preparation, as they can learn the activity along with the students, or they can use it as a starting point for their own versions of the lesson. As with all our trainings, we will provide a certificate stating the total hours of online training undertaken, upon the completion of a feedback form. As these are live trainings created at the time we cannot give exact hours, but we expect each session to run for 1-2 hours, so total training time we expect to be between 10-14 hours. Please note: This is not accredited by any state or national authority, so please check with your employer if this type of certificate will be acceptable for your professional development purposes. Get instant download access to these products immediately after your registration. This package of ideas and arrangements for classroom percussion instruments will give an excellent kick start to your students learning. 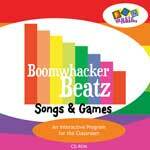 If you have boomwhacker pitched percussion tubes available, having access to this program in addition to our composition material will really enhance your children's learning. If you have access to apple devices, then having access to this GarageBand training in addition to our composition lessons will be invaluable. Want to watch a sample lesson? The sample below is just one of the seventy student videos and lessons that are included in this program. You will have twelve months access to all student videos and associated materials via a special members area website you can access in the classroom. Click here to launch a sample lesson from Grade 6. 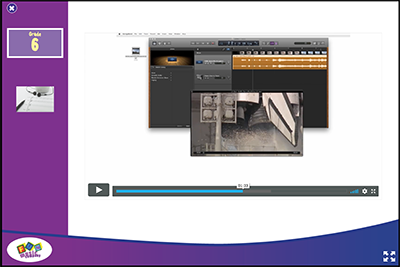 This lesson is half-way through the unit, where the students are just beginning a project to create film score music.